It’s hard to get anything in life for free but when it comes to shabby chic decorating you can get lots of great accessories at no cost to you. All it takes is an open mind, a little searching and some creative display. I’m not talking about any of the great vintage items that may have been passed down or given to you from family either. These of course are great to have and decorate with but I want to show you things that anyone can have access to. Keep in mind, that on their own some of these items may simply look like useless discards….remember the open mind?……….but seeing how they are displayed should give you some inspiration and an idea for what to look for. A great example is this section of wood from some kind of pallet. My husband brought this home from work…. I think to use it to put behind a trailer wheel to keep it from rolling. Anyway, it was sitting in the garage and I happened to spy it with all of those great numbers stamped across it. A perfectly normal thought was to bring it in the house to use for some decorating…….WHAT?! Okay, I did clean it up first. 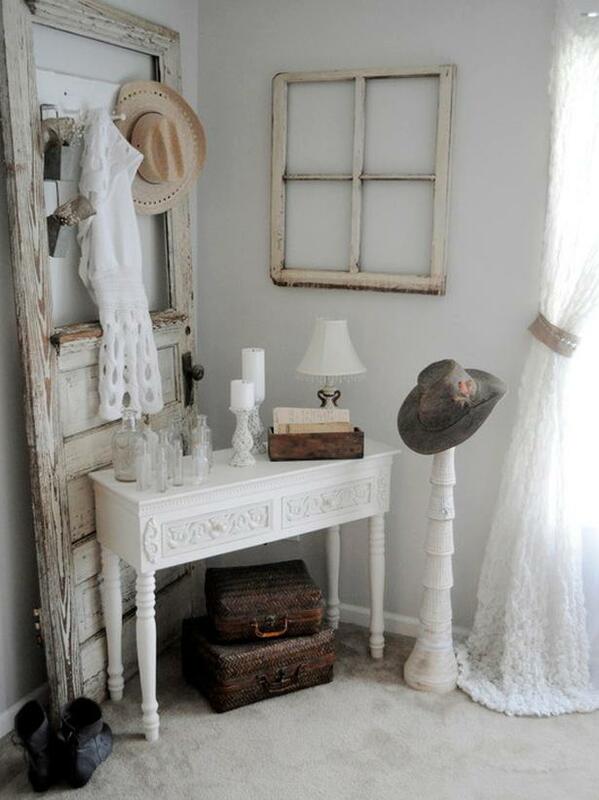 It fits right in with some of the vintage items and distressed wood! Notice the picket fence and seatless chair in the picture. I picked those up from a favorite antique store for practically free. They were kind of off to the side and I grabbed them with some other items I was buying. The bundled price really made them free. I have seen plenty of old chairs waiting by the curb for the garbage truck too. 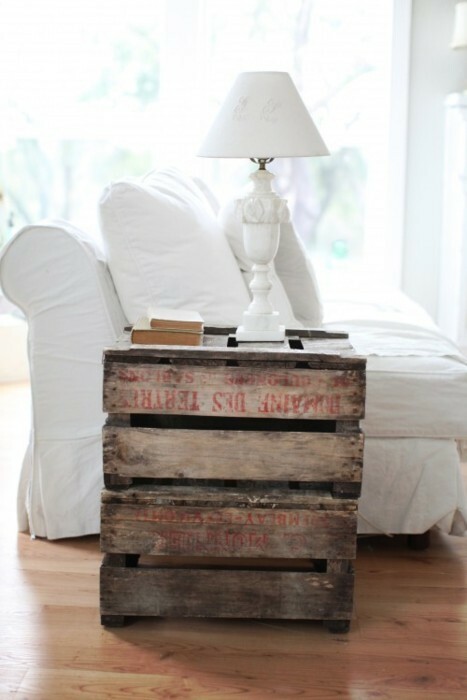 If you don’t mind dumpster diving, you could grab one, repurpose it and use it in your decorating. Do you know of anyone who is taking down an old picket fence? Ask for a section or watch for that along side the road as well! 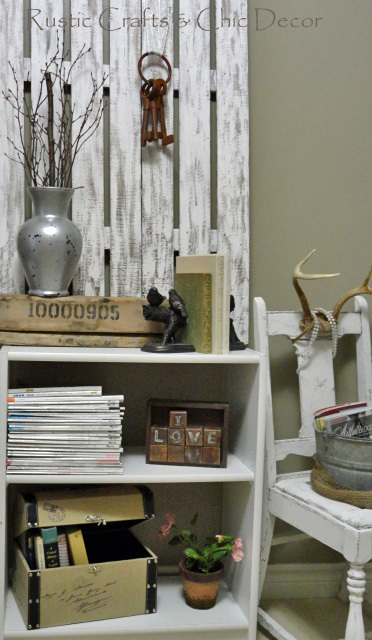 This shabby chic display from HGTV uses plenty of old and possibly free stuff. Check the free section of Ebay and Craigslist for old doors and windows. Another good source is Freecycle. You can join this organization in your area and have access to all kinds of free material. Since there isn’t any shipping involved, you will need to be able to pick up anything that you are interested in. 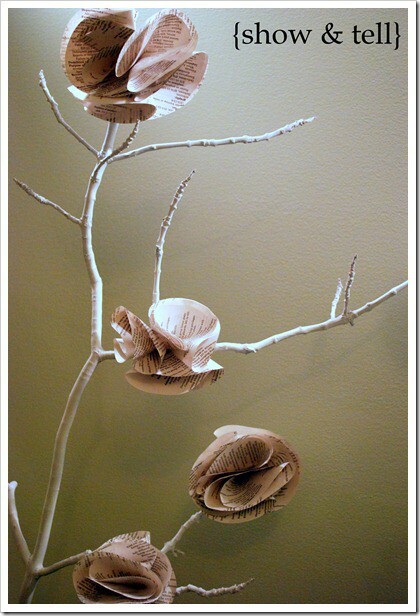 Sweet Pickins Furniture shows you how you can make your own shabby chic accessory with branches and book pages. I’m sure that everyone has access to these for free. 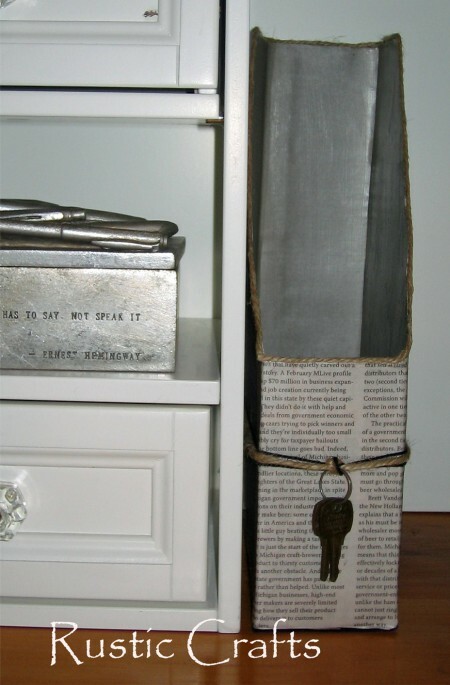 If you don’t have a book that you want to use in this way, you can get paperbacks for pennies at a thrift store. You can of course get pallets for free from many different businesses. All you need to do is ask. Your only limit on what you can do with these is your imagination. This rustic little side table has a lot of impact against all of the chic white. This larger table gets some extra dimension with the glass top and caster wheels. 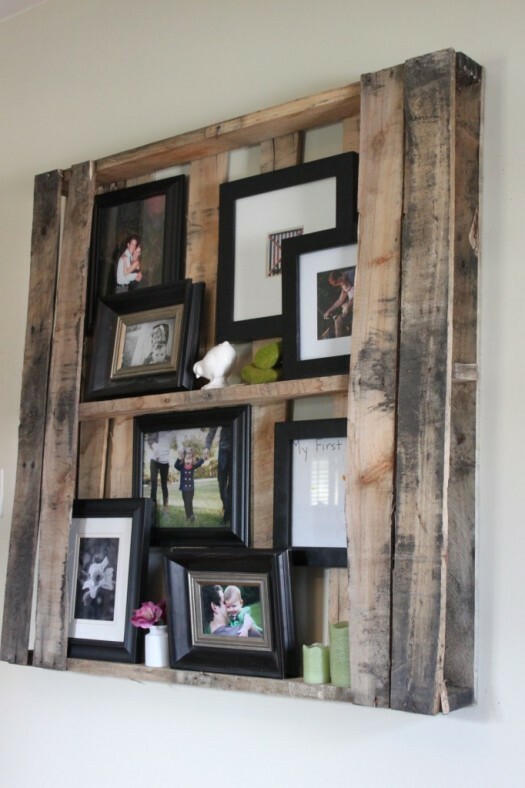 And, a pallet on the wall makes a wonderfully shabby display for photos. There is also so much that you can do with recycling common household items. I have a whole page full of links on this category – just click on the link in the side bar! You can create lots of free shabby chic accessories with what you already have in your house so it is easy to get started right now! This paper holder is made simply with a recycled cereal box and some newspaper. You can embellish it with other trinkets that you have around the house! 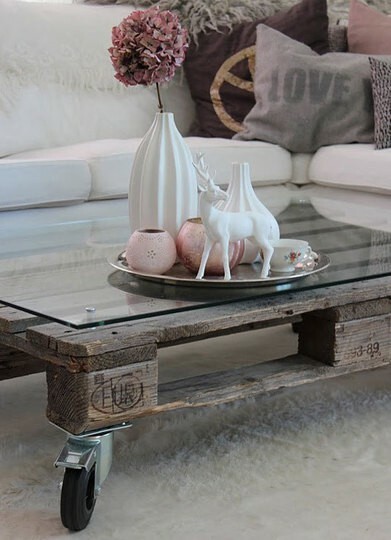 Love all of these ideas — especially that pallet shelf! Everything you have shown is amazing and beautiful, It does prove you don’t have to spend a fortune to have a beautiful home. I love your ideas, they re georgous! I love also a mixture of the fancy pretty refined stuff an rustic togather. I as a matter of fact have a beautiful white door with white peralized stained glass in it, I got this free, an it’s a true antique, I also have a white wood window frame I got for free as well, an a very pretty table of similar style I’m about to paint white. I could easily do a display so similar to this it would make anyone’s hair stand on end! An , actually I think I will do that. I just cannot believe all the beautiful ideas! But , I have to say I may also have an unfair edge, as my husband has a junk yard of sorts, we live out on a small farm , an he collects junk, tractors , cars , parts etc , an not nearly all , but quite a bunch of stuff he sells to people. An this is how ge makes our living. But , there’s also more than my fair share of junk an stuff left to use myself an be creative with. Out of a very large ten room house I have exactly two new pieces of furniture, the rest are all old, junk, and or antiques. Often that we’ve gotten totally free or for very very little cost. An my only cost other than that is if I want to redo or paint them in any way. An very often after they are cleaned up I do not even do that to them . The door an window I spoke of are two cases in point. I’ll be back here to look again . Thanks so much , this is just wonderful, an great fun too! Dixie Hacker Hurley. Wow! It sounds like you are in a great position for some fun decorating! Thanks for sharing.